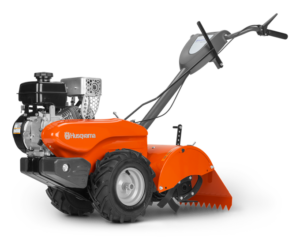 One of the few dual rotating tillers on the market, the Husqvarna DRT900H offers the advantages of both a forward rotating cultivator and counter rotating deep soil tiller. The dual rotating tines on the DRT900H provide deep soil tilling on densely packed earth as well as older lawns. The DRT900H also features drive wheels with heavy tread tires for optimized grip, forward and reverse gear for easy operation and a powerful Honda engine for landowners that need reliable performance time after time. 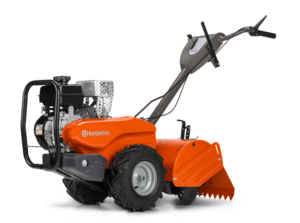 The TR 314C has a large 14″ working width and is ideal for frequent use – plowing, cultivation and ridging. The TR 317C has a large 17″ working width and is ideal for frequent use – ploughing, cultivation and ridging. Counter-rotating tines and high rotational speed make light work of your toughest projects in the yard. 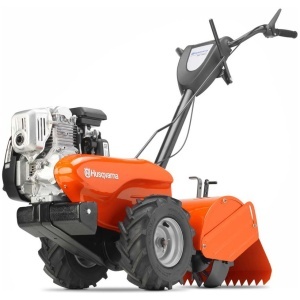 Husqvarna TR 317D offers the advantages of both a forward rotating cultivator and counter rotating deep soil tiller.